The Romagna area of Emilia-Romagna and Le Marche region share many a cultural and gastronomic characteristics. Bordering with one another, it is easy and joyful to visit both at the same time, especially if you focus the inland, rather than the coast, as it is here that their shared characteristics truly come to life. We suggest, more than a real itinerary to follow, some locations you may like to visit, depending on when you are in the country and how your fancy strikes you: let’s see! In Sant’ Agata Feltria, October is the month of the Fiera Nazionale del Tartufo Bianco Pregiato. For The entire month, each Sunday is dedicated to this rare and delicious prelibacy, with a number of folkloristic displays, market stalls and special events (one of the most important is the Gara per Cani da Tartufo (a competition for truffle searching dogs) to keep visitors busy. The fair offers other gastronomic yummies in addition to truffles, from fine prosciutti and salami to cheeses, wines, and honey, all sourced, of course, locally. 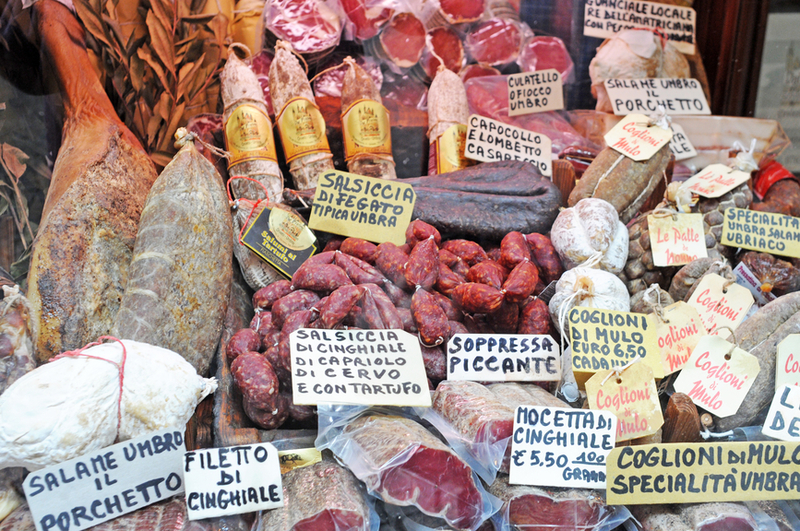 Try the salamino del fumaiolo, di cinghiale (wild boar) and salsicce al tartufo (truffle sausages). My favorite pasta dish is pici senesi con asparagi e tartufo. If you like the cucina di terra (earthy, traditional dishes, usually based on local, countryside produce) you will not be disappointed: wash it all down with a nice Sangiovese Colli Pesaresi and you’ll be certainly not disappointed. Sant’Agata was another Montefeltro stronghold: the Rocca, which dates back to 1130 and dominates the village at the northernmost corner, hangs precariously on a rock and is quite impressive looking. Other things to see in town are the Museo Rocca Fregoso, La luna nel Pozzo (The Moon in the Well), Il Vicolo del Bacio (The Alley of the Kiss), the Teatro Angelo Mariani and the Santuario Madonna dei Padri Cappuccini. Sant’Agata also hosts Il Paese del Natale just before Christmas, as well as la Mostra Mercato di Primavera in May. Each variety has its own distinctive characteristics. The ancient market town of Pennabilli lies beneath the northern slopes of the Monte Carpegna. Located under the jurisdiction of the Rimini province, the town was born in 1350 as a result of a fusion between the castles of Penna and Billi and the villages they controlled. Billi was thought to have Etruscan origins, while Penna used to belong to the Malatestas. The town now hosts a national antiques fair every July, but things to see include the Santuario dei Pensieri (Sanctuary of Thoughts),: L’Orto dei Frutti Dimenticati (garden of the forgotten fruits), il Rifugio delle Madonne Abbandonate (The Forgotten Madonnas’ Shelter) and the Santuario della Beata Vergine delle Grazie. Just outside Pennabilli you will find the tiny hamlet of Soanne and the lago di Andreuccio. There’s a fascinating tradition (la Befana Ritardata) associated with Soanne that relates to the Befana and her visits during the Epiphany: apparently, la Befana visits Soanne on the 6th February instead of 6th January, one month behind schedule, in fact. In 1875 the area was completely cut off by heavy snow and Soanne risked running out of essential supplies. Yet, the kids believed that the Befana would get through despite the weather and went to bed in eager anticipation. It was still snowing heavily the following morning, but no presents were to be seen and the kids felt they had been forgotten. By the morning of February 6th however, the roads were clear and the Befana managed to deliver her presents. She had not forgotten, but simply postponed all deliveries until she could get through. To this day, the Befana continues to bring gifts to Soanne on the 6th of February. Sitting on top of a stupendous crag high above the Valle di Marecchia, few people can fail to notice the mighty Rocca hanging precariously above the village of San Leo. According to popular belief, San Leo was once the mightiest and most powerful stronghold in Europe; perched on rocky outcrops all fortifications in the Montefeltro were virtually unassailable. St Leo of Dalmatia apparently founded San Leo in the 4th century. Dante once stayed in San Leo and mentioned it in its Purgatorio. St. Francis of Assisi came across some celebrations taking place at the Rocca di San Leo and decided to attend. He began to stir up interest amongst the crowd. Count Orlando dei Cattini, Lord of Chiusi della Verna and owner of most of the Casentino Apennines was also present at this gathering. He was so impressed by the teaching of Saint Francis that he donated part of his territory, a mountainous area known as La Verna, to be used as a sanctuary for meditation and prayer: this was back in 1213. Back to San Leo…there’s only one entrance to the village and it is an impressive way to get in. The village is tiny and Piazza Dante is where you will find most of the action at this time of year. Things to see: Cattedrale di San Leo, Pieve di Santa Maria Assunta, Palazzo della Rovere and the Fortezza Rinascimentale (the Rocca) The Museo d’Arte Sacra houses some interesting works from the 14th century. Not only is the Rocca di San Leo the most impressive looking in the Montefeltro, it is inextricably linked to the fate of one of the most enigmatic and talked about figures in Italian culture, Giuseppe Balsamo, aka count Alessandro Cagliostro. Cagliostro must rank as one of the most enigmatic and controversial figures in Italian culture. His life forms the basis of one of the most extraordinary and daring adventures of the 18th century. He was into alchemy among other things, and was also known to produce the odd elixir or two. According to local legend, whenever there’s a full moon in San Leo, Cagliostro’s ghost can apparently be seen standing by the road that leads up to the fortress. There is also a small liquorificio in Via Rosa that makes and sells Antico Balsamo Cagliostro, a delicate liqueur made from aromatic herbs. The producers claim, with tongue in cheek, that their elixir has the same thaumaturgical properties as the original produced by Cagliostro himself. Typical dishes: Pasticciata alla Cagliostro (marinated beef stewed in red wine), Tortelloni di San Leo and Coniglio al finocchio selvatico (rabbit with wild fennel). The growth of European economy in the early 15th century sparked off a steady demand for books. This demand was aided by the availability of paper being manufactured in large quantities. Although claimed to be a Chinese invention, the Arabs apparently were the original discoverers of paper as we know it in the 8th century. Because paper was a much cheaper alternative than parchment, more paper mills began to appear on the scene throughout Europe. The medieval city of Fabriano, to the southwest of Ancona, is not only the birthplace of Gentile da Fabbriano (you can see his four saints and Adoration of the Magi in the Uffizi-Firenze), it is one of the very first European cities ever to be involved in the production of paper. In the Marche, Fabriano is known as the Città della Carta because of its papermaking roots that date back to the later part of the 12th century. But its real claim to fame is that the filigrana (watermark) was invented here. Today, Fabriano still produces paper (much of it used for banknotes) and its biggest mill is the Miliani Paper Mill, founded by Pietro Miliani back in 1782. Not only is Miliani reputed to have introduced a number of quality improvements ad innovations in papermaking techniques, the company renovated what used to be the convent of San Domenico to create the Museo della Carta e della Filigrana. The Museum offers a fascinating insight into the history of paper and papermaking techniques. Alternatively, you can visit the Grande Museo dell’Horror e del Fantasy in the centro storico, which houses Europe’s largest collection of monsters, ghouls, aliens and nasty creatures, many of which featured in Hollywood productions. As you proceed westbound from Fano along the Via Flaminia, you will eventually reach the wild and rocky Passo or Gola del Furlo where the River Candigliano flows through. Apart from the ancient and well-preserved tunnel built by Emperor Vespasiano sometime between 76 and 77 AD, here we find an area of stunning natural beauty, as well as home to some rare species of wildlife. There’s also a smaller tunnel that dates back to 217 BC, through which the Via Flaminia would eventually run through, connecting the Adriatic coast with Rome. It was such a strategically important road that numerous battles took place along it, not forgetting that it marks the site where the Romans came to confront the barbarians invading Italy. There are stories of ghostly warriors (soldiers who fought against the Carthaginians centuries earlier) seen fighting alongside the Romans. In more recent times, the Passo del Furlo was one of Benito Mussolini’s favourite spots whilst en-route to Rome. In 1936, members of the local militia together with some local sculptors carved a profile of Mussolini in the rock high up Monte Pietralata overlooking the gorge, but only a small part is now discernible –and only just– from Acqualagna, because partisans blew it up after WW2. Heading in a southwesterly direction from Macerata Feltria towards Carpegna you will pass through some remarkable landscapes where you’ll find a village called Pietrarubbia (from the name Pietra Rubra – red stone). This is where the Counts of Montefeltro once feuded among themselves, leading to divisions within the family. You will notice a rocky outcrop to the south, with the remains of a castle (the most ancient of the Montefeltro), but head a little further west towards Carpegna and you will notice a strange shape that punctuates the skyline. At first, it looks like another fortification, but upon closer inspection you will see that this is a rather unusual rock formation, which is known as the Torrione di Pietrafagnana. It is called Dito del Gigante (the giant’s finger) because it looks like a finger pointing up towards the sky. According to the legend, this territory was once the home of a brutal and domineering giant. The Gods decided to eliminate the giant, but they fought with all their might to do so. In the end, growing ever frustrated by the continual fighting, they threw a bolt of lightning down to earth in a raging fit of anger. This caused the earth to open up and swallow the giant, who remaining undefeated, desperately attempted to free himself. This he could not do, although he managed to free his finger. Local legend also has it that over time, the giant’s finger was transformed into stone, as we see it today. Being constantly exposed to the elements, the wind and rain have apparently eroded parts of the Torrione thereby causing a howling noise, which again according to local tradition, is known as the Lamento del Gigante (the giant’s wailing). They say that Cingoli is the balcony of the Marche because of the views on offer. However, the hilltop town of Ripatransone (500m asl), which is approximately 10Km from Grottammare, offers the best views in my opinion and that is why it is called the Belvedere del Piceno. It was previously called the Baluardo del Piceno because it was so inaccessible. Another strategically important town like the ones you see scattered around the Marche, Ripatransone (from Ripa Transonum) has quite a history. It has the distinction of being among the first towns in the province of Ascoli to free itself from papal influence without external help following the battle of Castelfidardo (where Vittorio Emanuele II vanquished the Pope’s legions) in 1860. Ripa’s medieval aspect is still very much intact and there are traces of Renaissance architecture as well. It also has the narrowest street in the whole of Italy (43cm wide – I think it is in the Guinness book of records). And the house where Ascanio Condivi artist and author (he wrote Vita di Michelangelo, the artist’s first biography) lived. The coast extending from Cupra Marrittima down to Porto d’Ascoli is known as the Riviera delle Palme for its numerous palm trees. San Benedetto del Tronto is the largest beach resort in this part of the Marche. It started off as a Benedictine monastery, but grew into an important fishing port. Today, it still is important for fishing, but since the 1960’s it has developed into a modern town and holiday resort. The stretch of coast running south from San Benedetto del Tronto to Porto d’Ascoli (the Via Salaria starts here and runs to Ascoli and Rome) is quite civilised with its wide sandy beaches (although I prefer Grottammare). It is not as pretentious or as expensive as, say, the Versilia in Tuscany and offers a wide choice of holiday accommodation. The Comune have done an excellent job in revamping this stretch, although it gets quite congested along the SS16 “Adriatica” corridor. From here you can easily get to historic places like Ascoli (25 mins), Acquaviva, Offida and Castignano. There’s a decent marina and the centre of town has some elegant shops. You are also spoilt for choice for places to eat with its many seafood restaurants. Mythical and legendary flirtations are part and parcel of most regions throughout Italy. The Marche has its fair share, but one of my favourites is the story surrounding the enigmatic Lago di Pilato (there’s also one in Switzerland), which is located on Monte Vettore, up in the Sibillini Mountains. Not only does the lake get its name from a remarkable legend concerning Pontius Pilate, who is supposedly buried here, it is one of the most important visitor attractions in the entire Monti Sibillini National Park. Apparently, so the story goes, after being sentenced to death by Tiberius, Pilate was placed in a leather sack and then dumped on a cart driven by oxen. After being carried for many miles, the animals could go no further and ended up in this location where the cart overturned and Pilate’s body ended up in the lake. Sometimes the lake turns red because of Chirocephalus Marchesonii, a rare species of crustacean: it is said that the lake turned red at the time of the crucifixion of Christ. Another fascinating story is that the lake was also a place of pilgrimage where many sorcerers from all over Europe once came to hold their strange rituals around its shores, until Papal rulers put up a wall to prevent access to the lake. Some weird stones inscribed with occult symbols have apparently been found near the lake, suggesting perhaps that some truth, and not just myth, surrounds this very unusual place (sadly, no one knows where they are). Local legend also has it that one of the ancient and wise priestesses with oracular powers lived in these mountains. The most famous of these, the Cumaean Sibyl from Campania, took refuge in a cave in the mountains above the town, which is perhaps why they care called the Monti “Sibillini”. Her magical kingdom seduced many intrepid visitors, but those who came face to face with the Sibilla would discover that she was really a wicked temptress and once lured to her cave would eventually remain trapped there forever. There’s a fascinating and popular novel called Guerino detto il Meschino (first published in 1410) by Andrea da Barberino, which tells of the hero Guerino’s adventure in seeking out the Sibilla to obtain the truth about his origins. There are 2 access points to get to the lake: one from Foce (near Montemonaco) and the other from Forca di Presta (access via Arquata del Tronto). Both routes involve an 8-hour round trip. If you are into trekking, the best time to go is during late June/July. For those who are intrepid enough, there’s also the Grotta della Sibilla up in Monte della Sibilla. The Carnevale Storico della città di Offida is held religiously every year and offers excitement and passion, merriment and pageantry, entertainment and as much food and drink that anyone could ever wish for. This spirito del Carnevale is deeply rooted in the Offidani’s psyche. To an outsider, the festival may seem like the greatest binge of all time, but it actually camouflages what really goes on. Despite the modern standards of carnivals today, for the Offidani (this was once a predominantly agricultural community) this ritual dates back well over 500 years. It is an ancient ritual celebrating man’s constant struggle with nature. Colourful members of the congreghe (similar to contrade or quartieri in other parts of Italy) parading the streets and plying onlookers with their quirky brand of music. The Abbuffata del Martedì Grasso where il Sindaco, il Prete, il Notaio ed il Possidente (the mayor, the priest, the notary and the land owner) all dress up and stuff themselves with food in Piazza del Popolo, drinking champagne out of potties. I Velurd, a strange, pagan ritual involving setting fire to bamboo canes. Lu Bov Fint (il bue finto), a comical race which is rather reminiscent of a Spanish corrida, only that instead of a real bull you get is a man inside a wooden frame with a fabric covering, pretending to be an ox. Picture the following scene: packed streets as the backdrop and red and white (white for purity and red for sacrifice) costumed clad citizens as part of the scenery. The race begins and the ox is chased all the way across town, accompanied by the high drama of frenzied cries as the “animal” charges with a vengeance, venting its fury at anyone getting in its way. This goes on for hours. By early evening a fine haze of dust envelopes the streets as the crowd regroups in Piazza del Popolo. The mood seems tense. The ox is chased around the piazza one final time before meeting its timely end. Nature (the ox) has returned to dominate the Offidani for another day. But this time the people have won. The words of one happy local seem to capture the mood…”il bue e’ finto sì, pero’ l’allegria e’ tanta” (the ox may be artificial, but there is much happiness here).